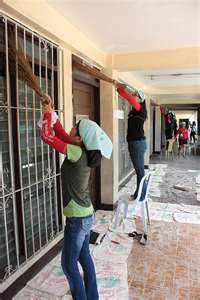 Brigada Eskwela also known as the Bayanihan sa Paaralan is a nationwide voluntary effort of teachers, parents, students, community members and other organizations to do minor repairs and clean-ups on their school in preparation for the start of the school year. 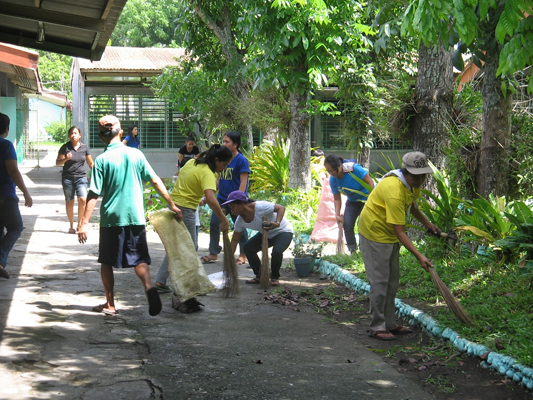 This week long event began in 2003 as part of the Oplan Balik Eskwela Program of the Department of Education. 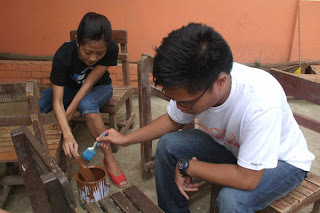 It encourages volunteers to give out their time, effort and even donate construction materials such as paint, cement, lumber and other materials which could be used for minor repairs and building. This year, the Department of Education launched the Brigada Eskwela 2012. The program will start on May 21 and will run until May 26. Bro. Armin Luistro, DepEd Secretary led the caravan which left the DepEd main office in Pasay to proceed to Justo Lukban Elementary School in Paco, Manila where the clean-up drive will officially kick off. The caravan was also joined by Manila Mayor Alfredo Lim, members of the Armed Forces of the Philippines, Private Corporations and even foreign volunteers from Australia and United States . This year’s Brigada Eskwela focuses on the importance of health and sanitation in school and improving the schools in indigenous communities. Aside from minor repairs and preparation for the school opening on June 4, the program will also involve construction and repairs of toilets in all elementary and secondary public schools.